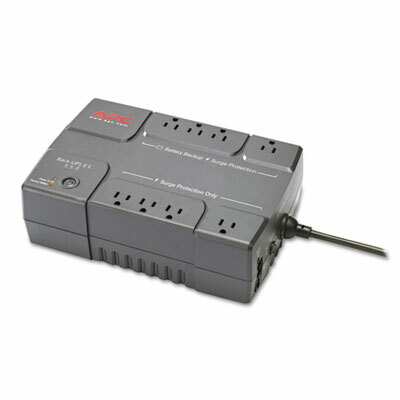 Designed to use less energy during normal operation, this backup system provides enough power for you to work through short and medium length power outages. Data line protection safeguards your equipment from damaging surges and spikes that travel along utility and data lines. Four stage LED status display indicates On Line, On Battery, Replace Battery and Building Wiring Fault conditions. Continuous tone and two different chime alerts notify you of changing utility power and UPS conditions. Wide spaced outlets allow you to protect equipment that uses input transformer blocks without blocking access to other receptacles. Disclaimer Statement(s) Run Time based on a load of 128.5 watts. Disclaimer Statement(s) Run Time based on a load of 165 watts. Disclaimer Statement(s) Run Time based on a load of 100 watts.